I started the blog in Feb or March of 2007. 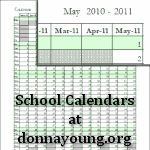 It is a mix of my life, my hobbies, homeschooling, donnayoung.org work, and my past. Comments are welcome.